The US Navy has 2 massive piers at this active base. Pier One and Pier 2. These piers are over 300,000sf each. This project involved Pier 2. In the past, this pier was used to as a dock for many of the navy’s destroyers and submarines. It had four large storage building constructed directly on it. These building covered about 75% of the pier. The navy needed to increase their open space on the pier and demolished two of the buildings. What was left behind on the concrete was mix of different floor toppings at many different levels. There was also over a thousand cubic feet of holes and voids. The navy needed the concrete patched and smoothed out. This work had to be done completely dust free and all water needed to be prevented from running into the ocean. This was a track project and would need to be completed in a two week period. 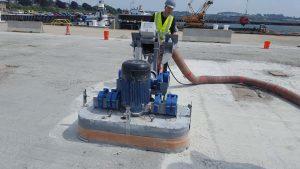 We recommended that the concrete be smoothed out using our large, 54-inch grinders. 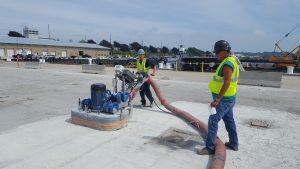 We also recommended that the entire concrete slab be prepared using a wet method. We specified a high strength, waterproof concrete repair mortar be using in filling all the voids. 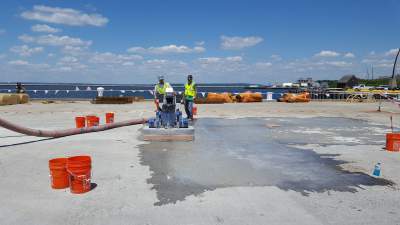 Wet- grind entire concrete pier using four, 54-inch concrete grinders. Square off all holes and voids using a wet saw. Patch all holes and voids with a high strength concrete repair mortar. This project was completed two days early and the customer loved the results. This project was contracted, managed and installed using personnel from our Cambridge, MA location.